DC-DLTS measurements were carried out to confirm whether there is a recombination center among the hole traps or not. As shown in Figs. 9(a) and (b), the DC-DLTS signal is compared to that of conventional DLTS. A decrease in the DLTS peak height of H0 is observed and confirmed by varying the voltage and the duration of the injected pulse. Here, we only focus on the hole traps that coexist in all p-type GaAsN based Schottky junctions and n+-GaAs/p-GaAsN heterojunction. The difference between these two structures is the temperature range in which the DLTS measurements can be carried out due to the freeze-out of carriers. The DLTS spectrum of p-type GaAsN in the heterojunction is shown in Fig. 8(a). Three hole traps H0, H2, and H5 are observed at 0.052, 0.185, and 0.662 eV above the VBM of GaAsN. Their peak temperatures are 35, 130, and 300 K, respectively. The thermal dependence of emission from the hole traps is plotted as an Arrhenius plot in Fig. 8(b). The activation energy, capture cross section, and density are given in Table 2. Therefore, E1 is considered to be the main cause of short minority carrier in GaAsN. It is required to investigate the formation mechanism of this defect in order to decrease its density and to recover the minority carrier lifetime in GaAs. It is worth remembering that the atomic structure of E1 may be free from impurities and doping atoms owing to the difference in the density of residual impurities in GaAsN grown with MOCVD, MBE, and CBE. Furthermore, the uniform distribution of NE1 in the bulk of GaAsN indicates that E1 is formed during growth to compensate for the tensile strain caused by the small atomic size of N compared with that of As. 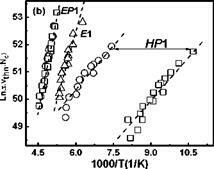 Therefore, the origin of E1 has high probability to depend only on the atoms of the alloy (N, As, Ga). 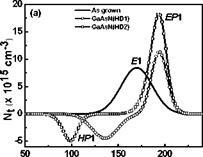 To confirm these expectations, the origin of E1 is investigated qualitatively by considering the results of two different experiments: (i) the dependence of NE1 to the As source flow rate and (ii) the effect of H implantation on the distribution of lattice defects in и-type GaAsN.